As knitters, we have all been put upon by someone for knitted goods. They see you knitting a pair of socks and ask you to make them a pair, or see something you have knit yourself and decided that they would like one too. I usually just tell people that they should learn and knit themselves one, but a lot of knitters feel bad saying no. Let’s face it, knitters are a kind breed. 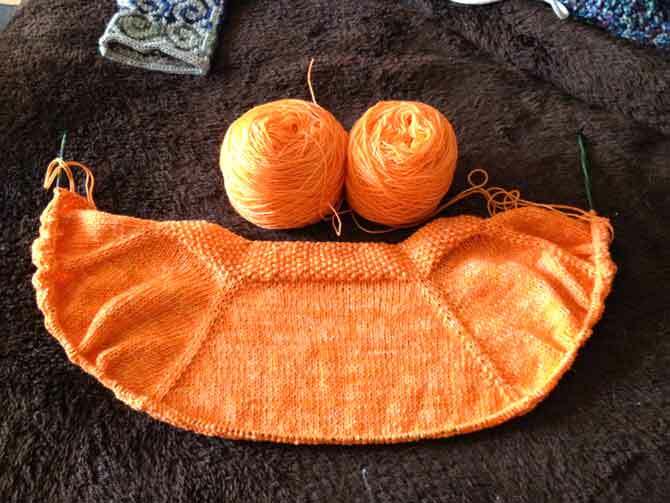 I swear I did not plan this, my knitting just happened to be smiling at me! 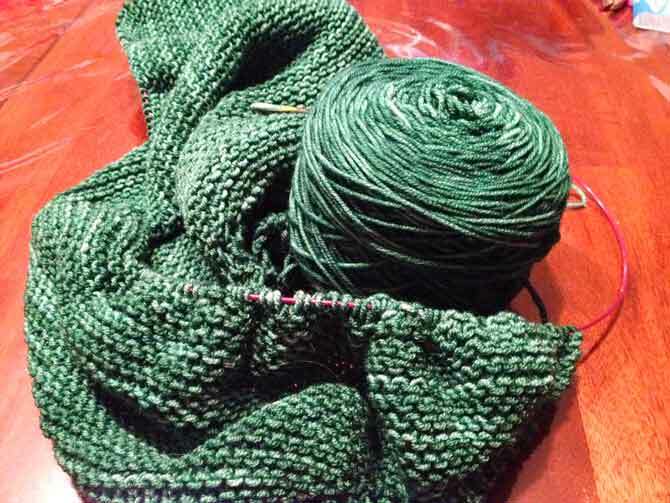 Most non-knitting people don’t realize how much work goes into one garment. It isn’t like sewing where you can make a pair of pajama pants in an hour. A solution can be to tell them how long it actually takes you to knit a sweater or socks. The asker probably doesn’t realize that one pair of socks takes hours and hours of work to make. 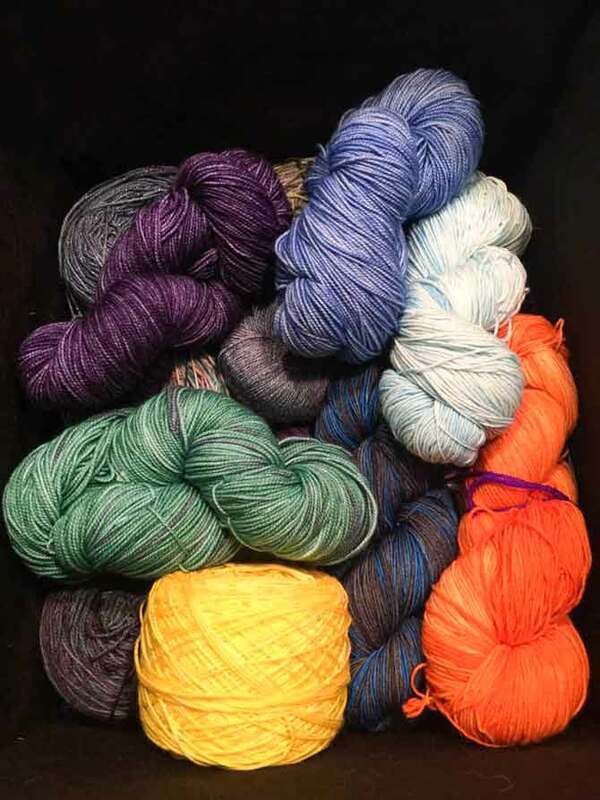 All the hand dyed yarn does not come cheap either! If that doesn’t put people off, I will suggest that they can’t afford me. I’ll say “the yarn alone costs $X” and they realize they can go buy a package of 10 socks for that much money. Once I had this exact thing happen. I had seen some yarn that was dyed after the TV show Dr. Who; it was Tardis blue and I really loved it. I was telling my friend about it and he asked if I would make him a sweater from this Tardis colored yarn. I was totally on board with this and made the deal that if he paid for the yarn, I would make the sweater. He was very enthusiastic about this idea and decided to ask how much the yarn was. It was $20 a skein and there was not a whole lot of yardage, so I figured it would take six or seven skeins to make him a sweater. After hearing that price he said he could easily buy a sweater for that amount of money and wondered why people knitted at all. Good question. As you can imagine, that particular person has never received a hand-knit gift of any kind. I would be weary of this technique though; some people aren’t scared away and will ask how much you would charge to knit them something. In this case, I usually name a ridiculous sum of money; something like $400 for a sweater. Most of the time people are not willing to pay this much and will suddenly change the subject of the conversation or remember an appointment and needs to rush off. There are the few people that will actually take you up on it, so be careful about the price you specify; make sure the price will be worth your while. If you possibly can, always knit with quirky named yarn, the above is Men in Tights. A technique I’ve applied more recently is to trade skills. I have a friend who is a hair dresser and we trade haircuts for knitted goods. The barter system is really great if the person attempting to wheedle something from you has a particular skill or hobby. There might be something in the deal for you that would normally be expensive or hard to replicate. The final technique I will go over is the ultimate cop-out. Just tell them you don’t knit for others. There are some things you do for money and then there are things you do for love. I have yet to hit a response to that, aside from “well don’t you love meeeeee?” Batting eyelashes or no, I usually look the person right in the eye and lift one eyebrow. 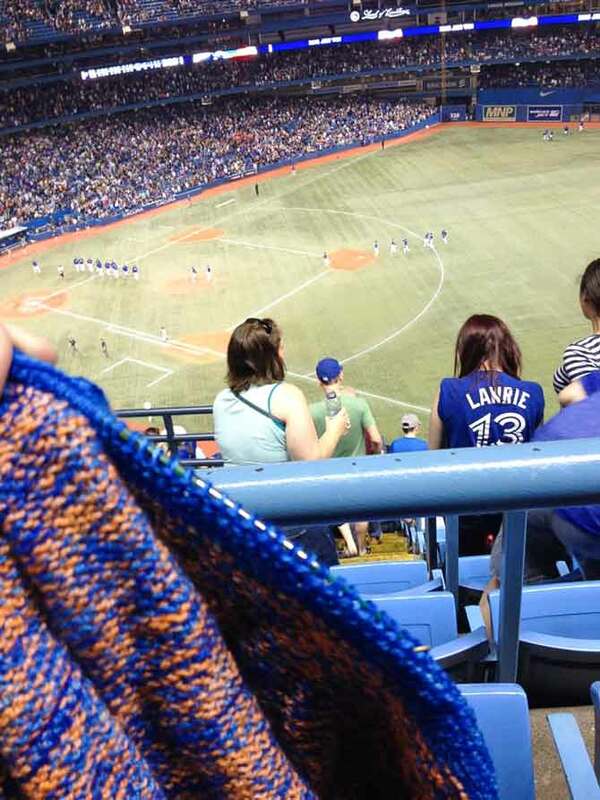 I don’t always knit for others, but when I do, I match my yarn to the home team. This is the perfect adage to end this post on. Remember that you should never feel obligated to knit someone something and don’t just give in because you don’t want to say no. If they are close friends I have offered to teach them, only one has taken me up on the offer they bought the yarn to make a scarf and lasted an hour. I’ve started a couple people on dishcloths. It’s something everyone can use and can be very small hahaha.